In order to protect themselves from financial losses resulting due to unforeseen events, individuals and institutions adopt strategies to mitigate the damage. The Futures and Options contracts can be used as a hedging strategy. 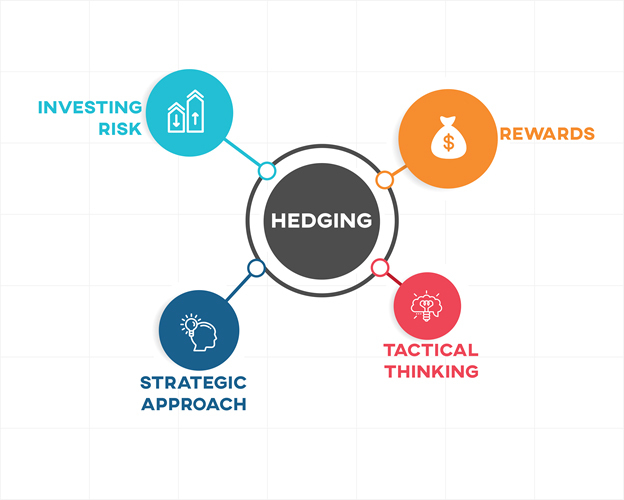 Hedging is often considered as an advanced investing and trading strategy, but unknowingly almost all individuals engage in hedging. Let’s have a look at the daily activities of Mr. Mehra, a professor at a reputed engineering college. He plays cricket on weekends, drives a car to college, has a life insurance policy, and also bought an extended warranty for his laptop recently. He is not aware of the term ‘Hedging’ but engages in it every day. When Mr. Mehra plays cricket, he ensures that he is wearing safety equipment. In doing this, he reduces the risk of being injured while playing. While driving, he wears the seatbelt to reduce the risk of injury in case of an accident. He purchased a life insurance to safeguard the financial position of his dependents in case of his death. By opting for an extended warranty on his laptop, he is minimizing any repair charges. Put simply, the measures he is taking to mitigate the risks associated with his activities is what we call as Hedging. Similarly, to protect themselves from financial losses that occur while trading due to any unforeseen events, individuals and institutions adopt strategies to mitigate the damage. The Futures and Options contracts can be used as a hedging strategy. Let us consider the example of ABC Automobile Company, which uses steel as the raw material. Now, the company is wary of the increase in steel prices. Any increase in the cost of the raw material can impact the overall revenues of the company adversely. Hence, to hedge against the risk of an increase in the price of the steel, the company may enter a futures contract. As a part of the deal, the contracting parties agree upon the price, quantity, and maturity period of the contract in advance. Now, if the price of steel increases, then buying steel from the physical market will result in a loss for the company. However, as the price of steel has increased, the value of the futures contract which uses steel as the underlying asset will also increase. Now, by selling this futures contract in the market, the company can make a profit. So, the loss incurred in the physical market is offset by the profit earned in the future market. In case of a decrease in the price of the steel, the futures contract’s value will also decrease and will lead to a loss for the company. However, the company can purchase raw material from the physical market at a lower price. Hence, the profit earned in the physical market will offset the loss in the future markets. The company hedges the risk of fluctuating price of steel by using futures contract. So as seen in the above case, we can infer that there is a risk/reward tradeoff associated with hedging. Hedging can be useful in safeguarding oneself against financial losses, but there is also cost associated with it. However, that is the price one has to pay to avoid uncertainty. In conclusion, to protect oneself against financial risks, one should be aware of and implement a hedging strategy. However, it depends on the individual whether the cost of hedging justifies the benefits associated with it.